Is it just me or is the season boring this year? So, it's the title decider this weekend between Shedden, Plato and Turkington, I am going for Shedden but what does everyone else think? I hope Turkington does it, although I wouldn't be upset with Shedden either. I want Turkington to get it too. It's going to be pretty close compared to last season. Having said that it would be great to see Matt Neal take the crown. A new year and new BTCC season, have to admit I am looking forward to it more than the F1! Surprised they don't have the Donnington GP circuit on the calendar. They haven't raced on the GP curcuit for years and I don't know why, perhaps they deem it too long to race on! Subaru will take part in the British Touring Car Championship in 2016 with championship-winning drivers Jason Plato and Colin Turkington at the wheel for Team BMR. Warren Scott's squad has inked a deal with the Japanese firm and will run estate Subaru Levorgs in the category. Scott will again join Turkington and Plato on the driver strength and another car might be added to the line-up. The car will be fitted with a two-litre turbocharged Mountune Race Engines-developed powerplant. Although the car is four-wheel drive in its road-going guise, it will be rear-wheel drive in the BTCC following a rule tweak last year. Scott said: "I have made no secret that I wanted to take the team to the next level, and that meant getting a factory deal. "Subaru has really engaged with this programme already. "They are very fired up about it and this is the start of a great new chapter for us. "The Levorg is Subaru's newest car and that is the one they want to promote, which is why it has been chosen. "Although it is an estate car, it has a very strong drag coefficient and also the dynamics of the boxer engine mean that the weight is lower down in the unit, which will help with the weight distribution of the car. "If you looked at all of the cars available that could have fitted into the BTCC regulations, the Levorg would be very high up on that list, which is why we are delighted to have secured this." Plato, who was instrumental in pulling the deal together, believes the car will be a perfect platform for success in the BTCC. "From all the initial work that has been done on the car, I am buzzing with excitement about this," said Plato. "It is almost the perfect car for the modern generation of touring cars. "Subaru is an iconic name with a successful motorsport heritage, and we want to write the next chapter with the firm. "This is going to be something very different and I hope the public gets behind it." Two-time champion Turkington, who drove one of Team BMR's front-wheel-drive Volkswagen CCs last season and claimed the Independents' Trophy, said: "We wouldn't have decided to do this programme unless we thought we would be more competitive than we were with the VW CCs that we had last season." I thought they did last year, guess not. I don't think it's that much longer though, maybe about another 15 seconds, but I guess they are touring cars and not F1 cars. That Scooby looks niiiiiiiiiiiiiiiiiiiiiiiiiiiiiice. Loving the colour scheme. [QUOTE="Varsh, post: 6498747]I thought they did last year, guess not. I don't think it's that much longer though, maybe about another 15 seconds, but I guess they are touring cars and not F1 cars. Nice to have a new manufacture in the Championship, have been watching BTC for a number of years now and it just seems to go from strength to strength! You know what would be funny? If the BTCC once again becomes the top tier of motorsport. Happened in the 90's. I'm sure they'll give you a wonderful debut race by forcing you onto the grass all the time. "Super touring cars" back when the works teams would release small model changes to gain a tenth or so on the tracks or employ F1 teams to build the cars for them e.g the Williams Laguna. 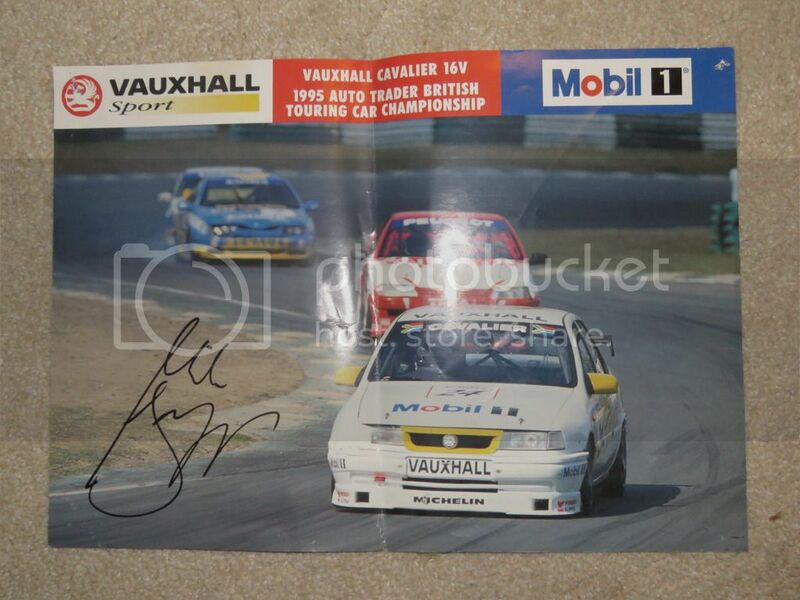 I think I still have a couple of signed posters knocking about I will dig them up later. Not sure who it is. Can anyone tell? Aaah the Vauxhall Cavalier of Mike Briggs. John Cleland thrashed him.